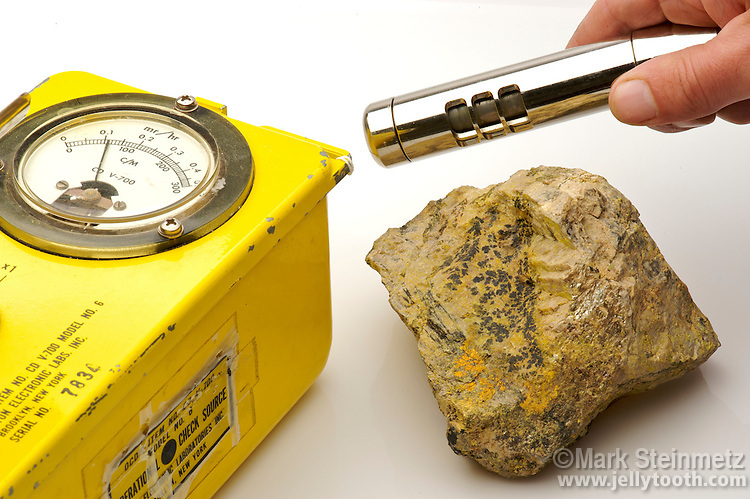 Geiger counter measuring radioactivity of uraninite with gummite, the latter a stage in the alteration of uranitite, an important ore of uranium. The gieger counter (set at 100x) is reading a little over 6000 clicks per minute (c/m), or 11 mr/hr. Typical background radiation is 30 to 40 c/m or .03 to .04 mr/hr, thus the specimen is approximately 200 times more radioactive. Grafton Center, New Hampshire.